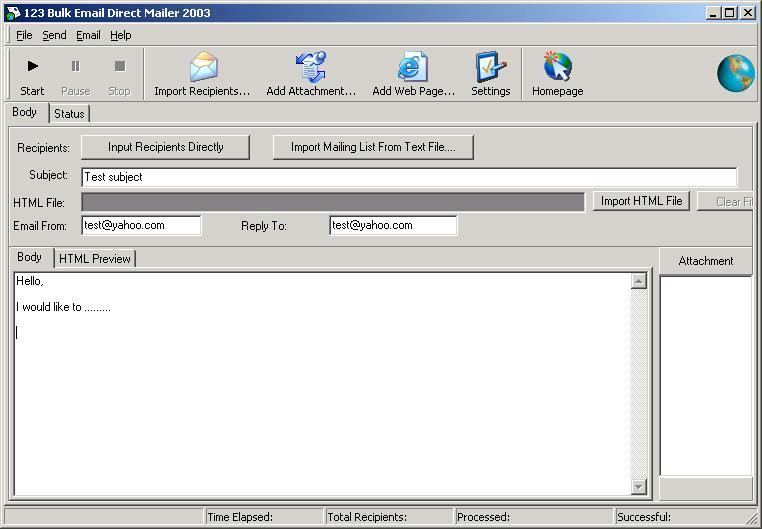 123 Bulk Email Direct Sender is a professional high speed bulk email direct sender program. It is an ideal for newsletters, targeted marketing, and keeping in touch with clients. Because this mailer sends out mails in MX mode and works like a mail server, you don't need unreliable blind relays anymore. As a multi-threaded application, 123 Bulk Email Direct Sender's normal sending speed can up to 50,000 e-mails per hour. It also has a professional and simple user interface so that everyone can set it up in few minutes. Order 123 Bulk Email Direct Sender NOW!